The high pitched scream. The vibrating power. The imminent threat of horrendous injury or even sudden, violent death. You’ve assessed the scene, formulated your plan; you take a deep breath and begin your plan’s execution. The chips fly as you begin; in no time at all one of nature’s largest, and most majestic organism’s teeters on the edge of falling. One last check to ensure the area is safe, and you begin the final cut. You hope that you have planned correctly. You hope that there isn’t a random, unseen flaw in your plan, or in the wood. Trees don’t hold grudges, but fate can be a fickle mistress. The giant begins to move, and so do you; you quickly turn and follow your escape path. You must resist the urge to turn to soon, but you want to see it all. Finally you turn and watch the final moments of a giant’s fall. With a loud crash it’s over, and you can relax as you plan the next phase. Combining the intricacies and mysteries of physics and trigonometry with the thick browed savagery of a more primal time, the art of the sawyer is a thing of primal beauty. The work is physically demanding, as sweaty as it is dangerous. It is also a mental game: a challenge and a thrill. It can become an obsession. What started as a simple problem faced by many homeowners led me down the rabbit hole into a grand adventure. My problem was a common one: I had some trees near my house that had become dangerous, or at least unsettling enough to make me nervous. They needed to be taken down for safety reasons. Some trees were too close to the house and lately there had been many strong storms with many trees being blown down in the area. Some were slowly dying and dropping limbs during every windstorm, and a few were growing at the top of an embankment that was gradually eroding underneath the trees root structures. The trees had to go and there were enough of them to pose a substantial cost to pay someone else to remove them. Plus, there was something about hiring someone else to cut down my trees in my yard that offended my inner machismo. So, in an effort to save face and money that would be better spent elsewhere, I decided to take the plunge and do the job myself. For many, the chainsaw is the ultimate power tool. A marker on the road to manliness. And there I was, forty-two years old and I had never used a chainsaw. I was a chainsaw virgin. Other men would scoff at me, respond with a derisive “You’ve never used a chainsaw?”. It was the high school locker-room all over again. But like the high school locker-room, upon closer scrutiny I discovered that many of my peers were also chainsaw virgins. Many were liars when it came to owning up to whether they had used one before, and of those who had, most did not know what they were doing. Their proficiency and abilities were greatly exaggerated. And so like so many before me, I turned to the internet in search of knowledge in how to tame this mechanical beast (how much mileage can I get out of this crazy metaphor?) Unfortunately the internet was also cluttered with unfounded claims of chainsaw mastery. Oh to be sure there were rich veins of knowledge to be mined, but the internet was also filled with fool’s gold. Oh, the hours of videos I watched, the pages of forum posts and articles I read and scoured, all in the pursuit of gaining some practical, and safe, knowledge in how to accomplish the solution to my problem. Perhaps that is what led to this obsession: the challenge, the work, and the thrill of power. Plus chainsaws are awesome. Really, really awesome. And so a blog idea was born. I hope you enjoy the ride. In future posts we will explore the joys of finding the right compromise between size, power, cost, and durability when shopping for a new saw. We will also explore the various gear and accessories related to operating a chainsaw. 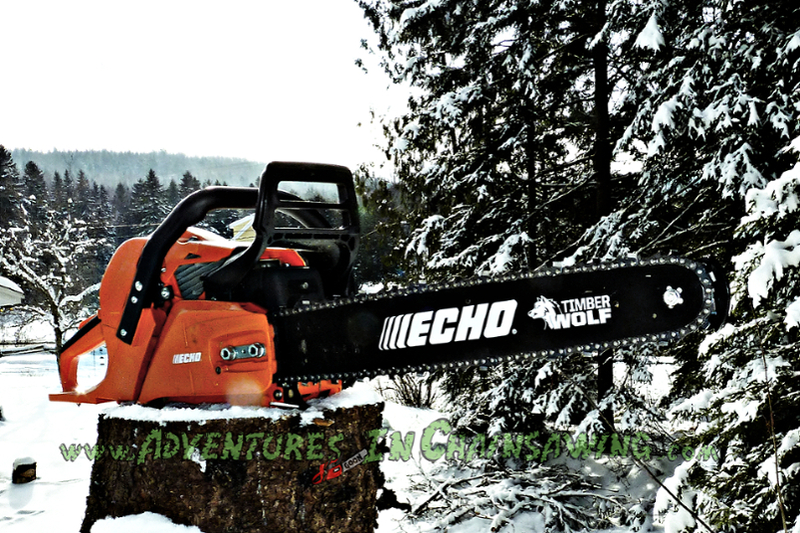 It’s time for some adventures in chainsawing. And now we come to the disclaimers. The first being that I am not an expert. I don’t make a living with a chainsaw, nor am I a certified instructor. I have not logged thousands of hours with a chainsaw in my hands. Hell, I don’t even heat with wood, so I don’t buck up cords of wood every year. This blog is meant to be a place that details my experiences, and what I, a dedicated amateur- an aficionado if you will, have learned in the quest for improving my knowledge base and skills with a chainsaw. Take what you read with a grain of salt. I whole heartedly advocate taking charge of your own adventure into learning, but I do hope that you find this blog to be a good starting point. This entry was posted in Origins and tagged Origins, welcome by A.J. Kilpatrick. Bookmark the permalink. A fantastic resource! Informative and accessible.